Successful salespeople generally listen way more than they talk. They have a way to make prospects feel listened to and heard. They create an environment in which the buyer feels that the seller is collaborating with them to achieve a mutual goal. Their superpower? Sales conversations! In the first post in this series, we focused on qualifying leads or determining if we wanted to pursue the lead and invest time and money in trying to sell to them. and knowing that you can deliver what is expected. Once you have put a neat checkmark next to all the bullets above, you have qualified your lead as a prospect. To take the sales process further, you need to start a series of sales conversations. These conversations should center on how your service or product can be used by the buyer. Your role is similar to that of a coach. Just like a coach, your job is to ask questions, not provide answers. Sellers that subscribe to the ABC of selling (“Always Be Closing”) believe they can talk buyers into anything. This view of selling is at the core of what’s so wrong with traditional selling. We’re naturally curious as humans and buying is an experience we enjoy. But only as long as we do it for us. Traditional ABC style selling is something that is often done to us. 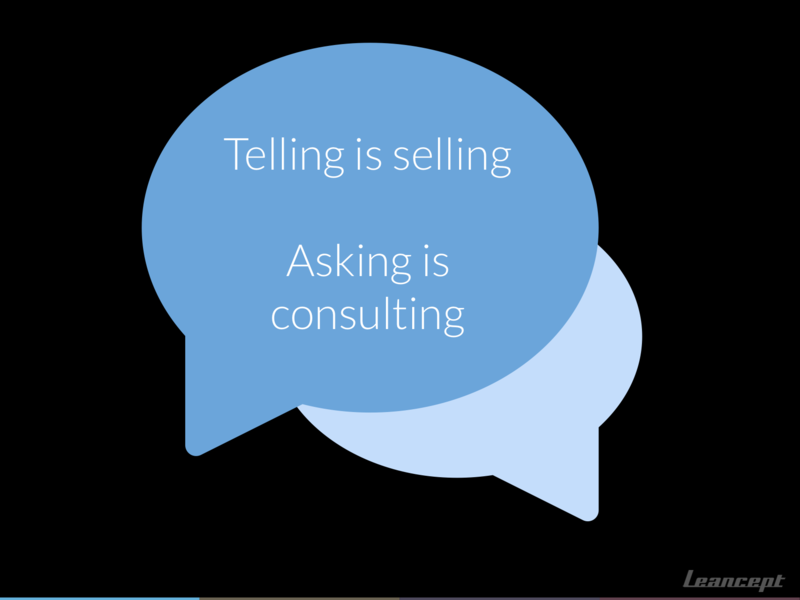 Your job as a salesperson isn’t to deliver answers. So don’t show up with a Powerpoint presentation and a set of canned answers. Instead of focusing on what you have to tell, focus on what you want to learn so you understand what the buyer needs need. A salesperson is a buying facilitator leading the buyer with questions that are biased towards the seller’s offering. In the process of guiding your prospect towards a decision to buy, you will need patience and lots of it. In many areas of business, sales cycles can range from hours to weeks. There are countless examples of stressed salespeople, anxious to meet targets, having ruined a potential deal by stressing out the prospect. Just so you know, buyers aren’t clueless either. Many companies calculate performance scores monthly or quarterly. Savvy buyers know this and use it to their advantage, in business-to-business and business-to-consumer deals, to pressure salespeople into concessions and discounts. The radio show and podcast This American Life covered this in a 2013 episode titled “Cars”, which I highly recommend. Even if you aren’t a full-time sales representative at a big company with targets and quotas, it’s smart not to pull all eggs in one basket. Expect your sales processes to vary in duration. Plan for it and make sure you have several sales conversations running in parallel. A way to think about this is to compare a salesperson to a farmer. By sowing seeds and spreading fertilizer (marketing), sprouts (leads) poke out of the soil which you then water (nurture) over time until they’re viable (prospects) and you can harvest them (closing a deal). I don’t know about you but in my experience, many salespeople who subscribe to “Always Be Closing” would love to own a mind-control device. To them, winning the deal is all that counts. Many of them have been trained in a number of psychological tricks to win over hesitant buyers. In many cases, this results in buyers thinking “oh, how did we end up here?”. That is not a good thing. Buyers want to feel in control. Just like everyone else. One of the most disrespectful things you can do is to take away someone’s autonomy. But it won’t do you much good. Just like the crafty snake oil sellers of the wild west, who thanks to charms and winning personalities succeeded with trickery, eventually ran out of towns that welcomed them. 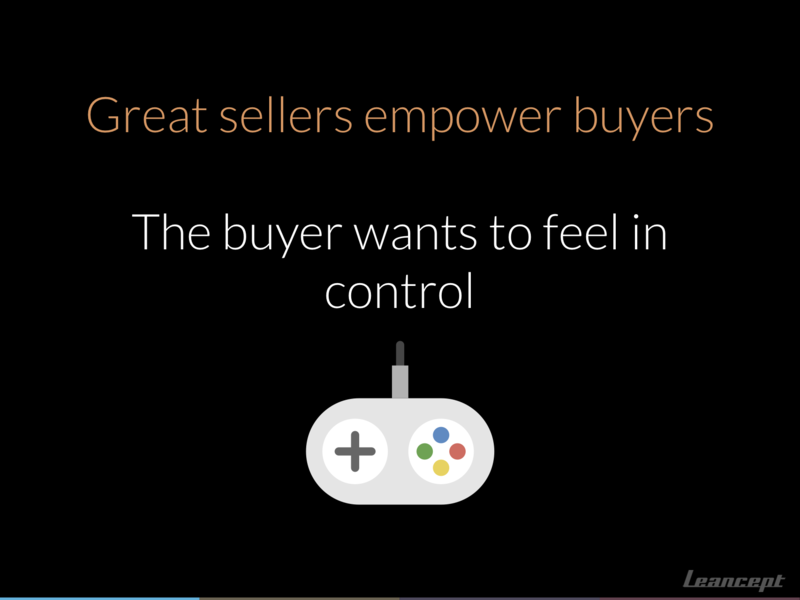 So will you, if you do not empower your buyers. In my opinion, this means accepting the word “no.” When someone objects, you have to respect it. In fact, chances are that you invited that objection through your own actions. Usually due to making unfounded assumptions and prescribing before diagnosing. 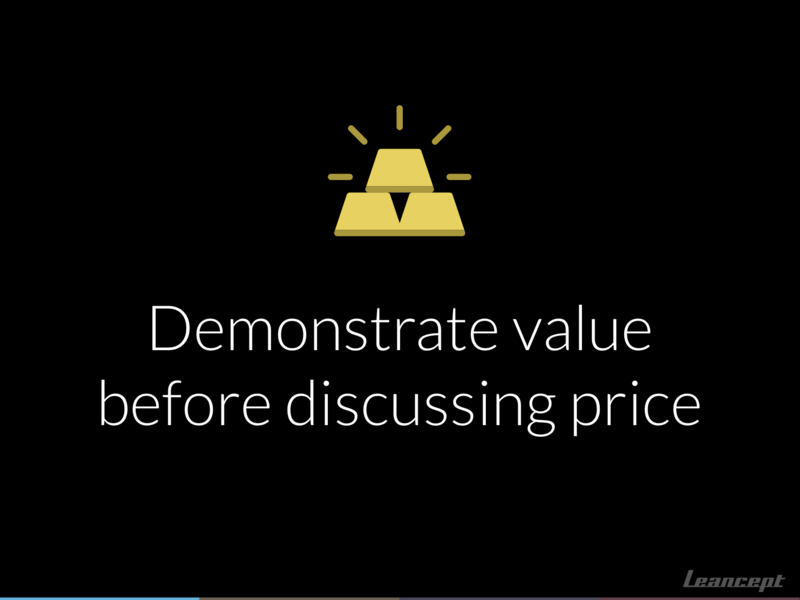 Demonstrate value before discussing price. One of the hardest questions to answer early is “so how much would X cost us?”. This is a question that you’d like to get as late as possible, and for a simple reason: the opportunity to shape the prospect’s perception of value. This is why salespeople are trained not to lead with the product. 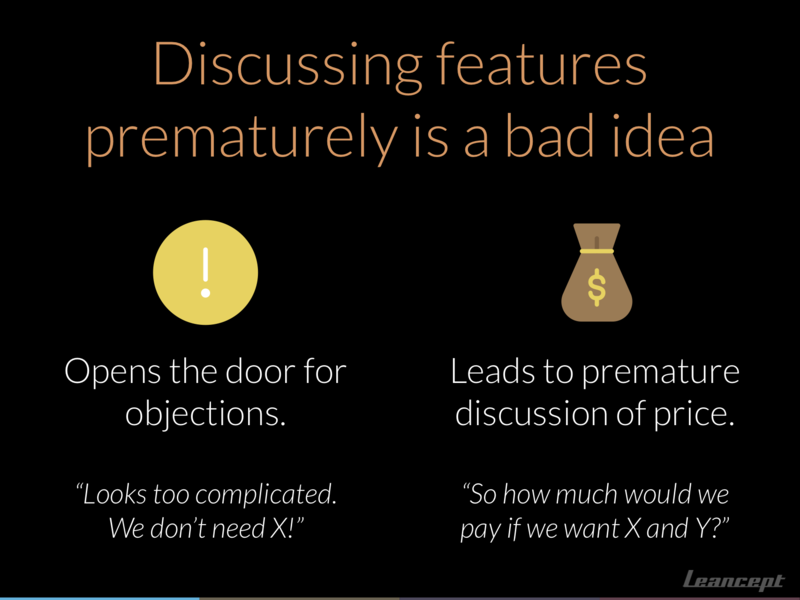 Talk about a product and its features will automatically trigger either objections (“I don’t need that!”) or the question of price (“That must be expensive!”). It’s not about what your offer can do for them. You will want the buyer to see what they can do with what you’re offering. Once they’re aware of that – the benefits of the offer – the price will be considered within the right frame of reference. To manage this well, it’s important to lead the sales conversation. I recommend writing a plan if just to mentally prepare yourself. The plan can be as simple as a list of bullet points of topics you want to discuss and in what order. Also, write down questions that you expect the buyer to ask. This question should be one of those you practice for. I suggest considering a price range as part of your preparations. If it’s a high profile meeting, it might be wise to practice your sales conversation plan with a colleague or friend. Though sometimes, and in spite of planning, you do get the question about price early. This question is indeed tricky and buyers know it. However, it can also be a blessing in disguise and help you determine if the client has enough budget. If someone cannot buy, then you will want to know that early to avoid wasting more time. Below are some ways to handle this question. Regardless of what approach you choose, it’s important to be confident when you do it. Another approach is to ask the client how much they spend on solving this problem now, or what kind of return they expect. It doesn’t matter if they don’t know the answer. The important thing is to help them view your offer in relation to a known cost. In other words, as an investment. 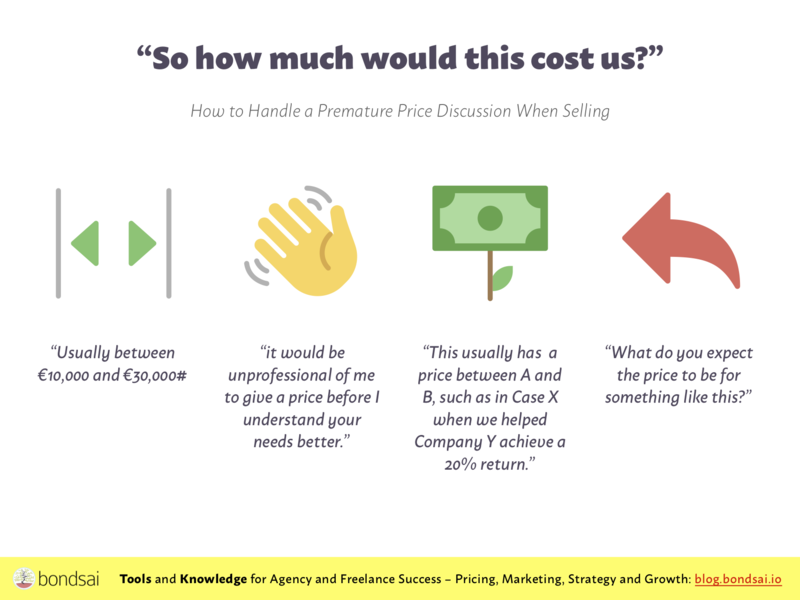 Ask “what do you expect the price to be for something like this?” Just don’t use the word cost if you can avoid it. This is a rather bold move but it will help you determine if the buyer is indeed serious and can afford what you’re offering (not just “kicking tires”). Using questions, you shape the sales conversation so that the buyer sees the potential of your product or service. A great way to do that is by helping them visualize a reality in which the product or service is being used. Such a reality will form a buying vision – a better version of reality which they can achieve with your help. In the book, CustomerCentric Selling, a fictional scenario involving the selling of a CRM system is described. The buyer isn’t very tech-savvy and the seller knows it so he chooses a different angle than to talk about technical features. This is an example of turning a feature – detailed access control from any web browser – into a realistic and specific scenario. Scenarios like these help buyers visualize how they can save money, earn money or reduce risks using the product or service. Scenarios can often be expressed as single questions in the form of “When you are…<situation>” or “When you do…<action>” followed by, “would it be useful to… <feature>.” These need to be based on real-life situations the buyer often experiences to effectively connect features to the real needs of the buyer. The only person who can call something a “solution” is the buyer. A salesperson can lead a buyer to draw that conclusion by helping them connect the dots. But a salesperson can never judge something to be a solution for a buyer. Yet many salespeople do. Isn’t that presumptuous? Not all of us have the good fortune to sell exciting products. I mean those services and gadgets that work like magnets on the minds of prospects of considerable means. The Apple equivalents of design and marketing services. If your service seems like a commodity to the buyer, your salesmanship is even more important. This is your second chance to win the minds of buyers. If your marketing efforts have failed to differentiate you from the competition, you can rectify that now. A sales conversation that is markedly and positively different from what the buyer expected will be noted and remembered. Sellers are eager to shorten decision paths and vie to talk to decision makers. Yet once there, many are woefully unprepared. What often happens is that they run the same sales pitch as they did to a tech lead at another company the previous week. An executive has other priorities and different problems to solve than someone who implements ideas. If you run the same script with them, they’ll refer you to their tech lead. That’s only logical seeing as the two of you seem to speak the same language. To get mindshare, you need to adapt your message. 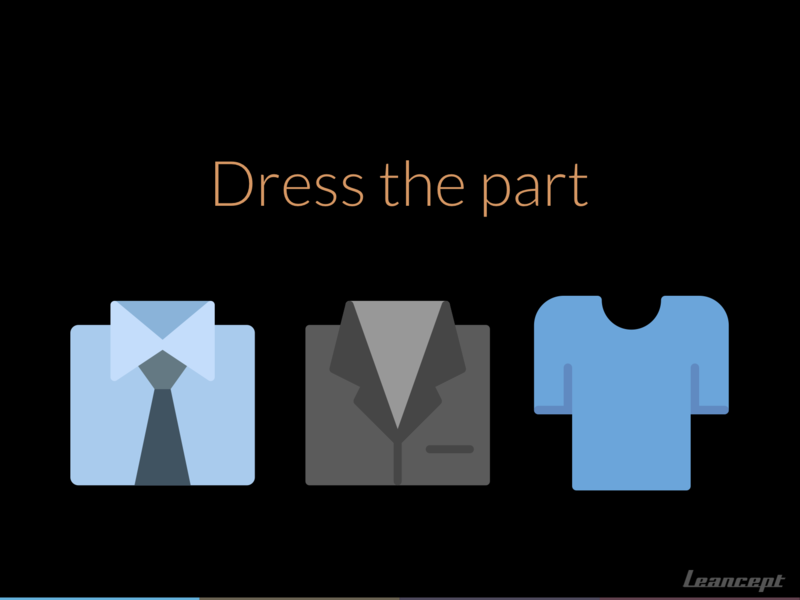 The same principle applies to your manners and how you dress. By reading up on the person you’re about to meet (using LinkedIn, for example) and then learning about the company where they work, you can avoid making a mistake that risks tarnishing your company permanently. People remember bad sales experiences and the stories get retold. I know, because I hear them every week. 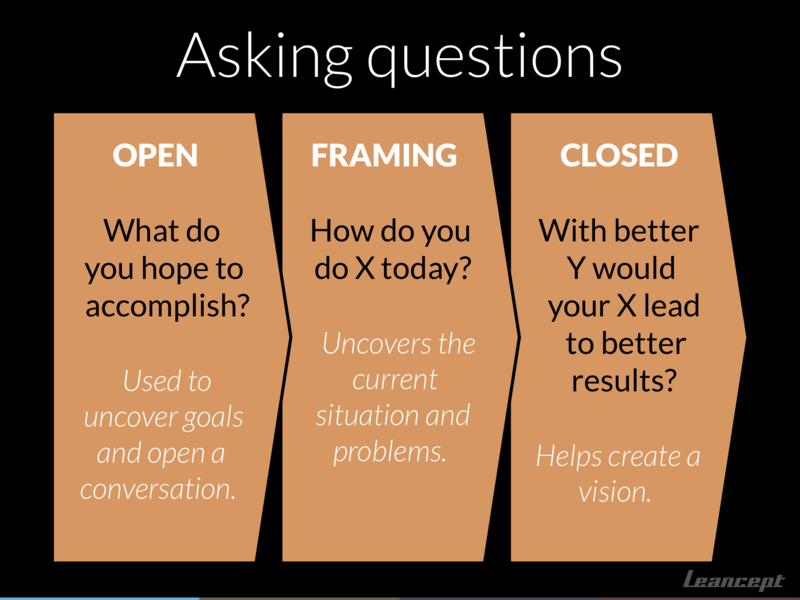 Questions in sales conversations: open, framing and closed questions. Ask questions that are open-ended, framing or confirming. Listen actively (and take notes if needed). 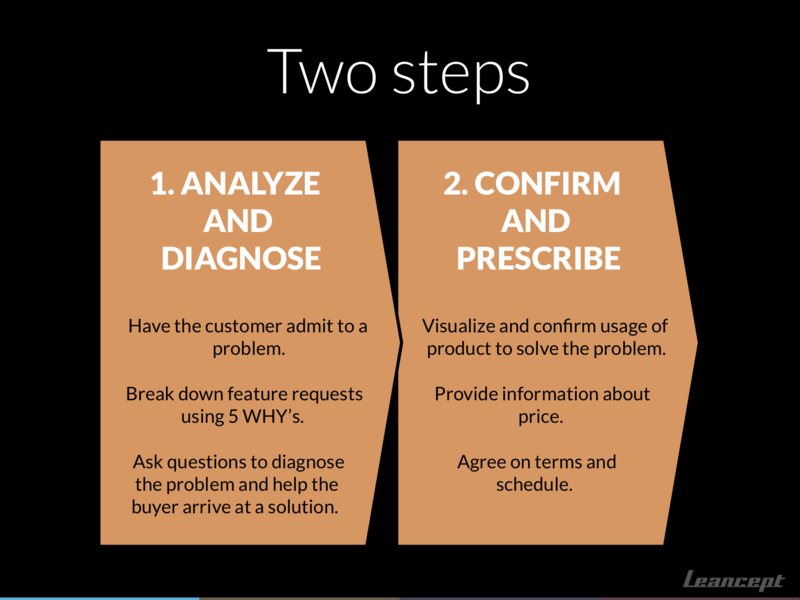 The sales conversation with the buyer is the means by which you can diagnose the problem and build a vision. For that to work, you need to lead it through the questions you ask of the buyer. You can do that by using three types of questions, in the following order. At an early stage in your sales conversation, when you are trying to establish rapport and a sense of affinity, so-called open-ended questions are useful. They start with “why,” “how,” and “what,” and invite the buyer to share. If you ask these from a point of genuine interest and empathy, most people will open up. The drawback is that they can go anywhere. In order to guide the sales conversation, you can use control or framing questions. These often come in a form like “Is it because…? If so, then how much and often?” This kind of question seeks specific information in well-defined areas and help develop the buyer’s vision. You need to tread carefully though since this kind of question can make buyers feel uncomfortable. Pay attention and tune in to the buyer’s responses and body language. 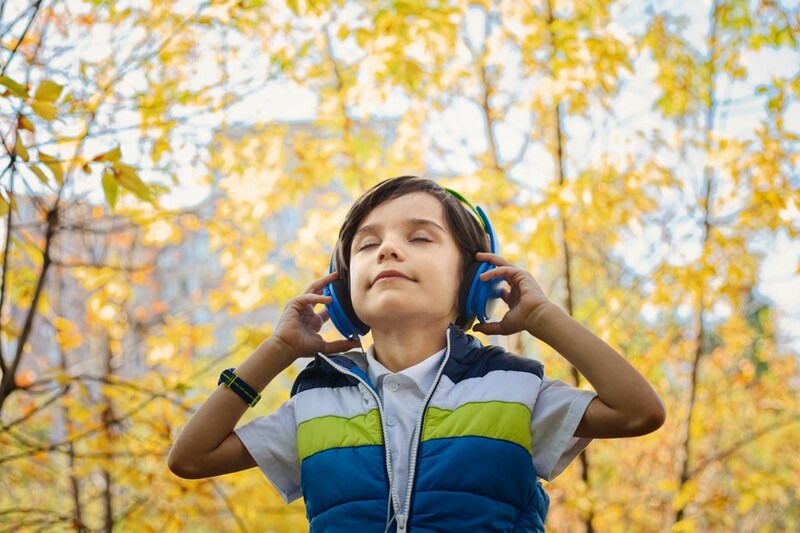 If they appear reticent or tense up, return to open-ended questions to re-establish rapport. Once rapport is back, you can try framing questions again. 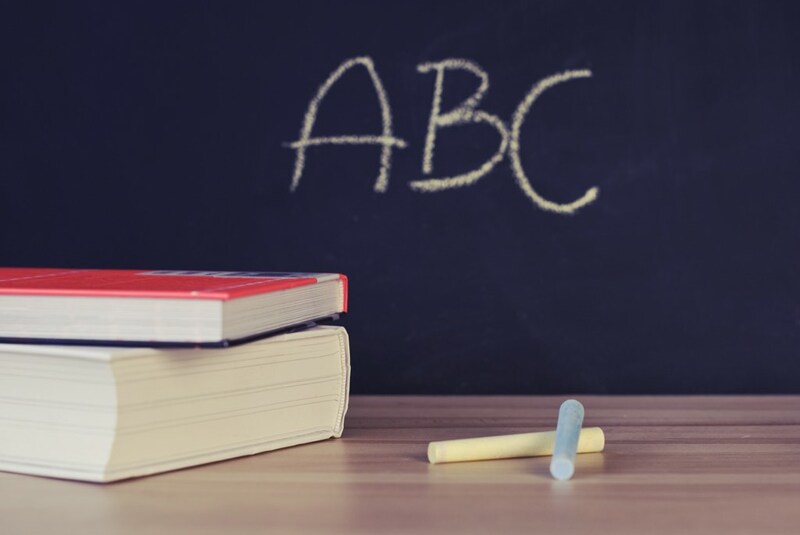 One way to phrase a confirming question is by paraphrasing what the buyer has said: “So if I understand you correctly… is that right?” This type of question summarizes your understanding of the buyer’s responses. By using these questions, you demonstrate your ability to listen and show your empathy. They prove that you understand the buyer’s situation. They can also help identify misunderstandings. ABC, “Always Be Closing.” With value-based selling, closing comes naturally. A successful value-based sales conversation will lead to a transaction or deal, carried there by its own momentum. There likely won’t be a dramatic and nail biting-inducing scene along the lines of “So what do you say? The opportunity if a lifetime, I tell you! You’d be mad to say no to this!”. If done right, the final step will happen naturally. There won’t be any final opposition or resistance. All the critical questions have been asked, the information provided and no “buts” and “ifs” left unresolved. Two steps of sales conversations: 1. Analyze and Diagnose, 2. Confirm and Prescribe. 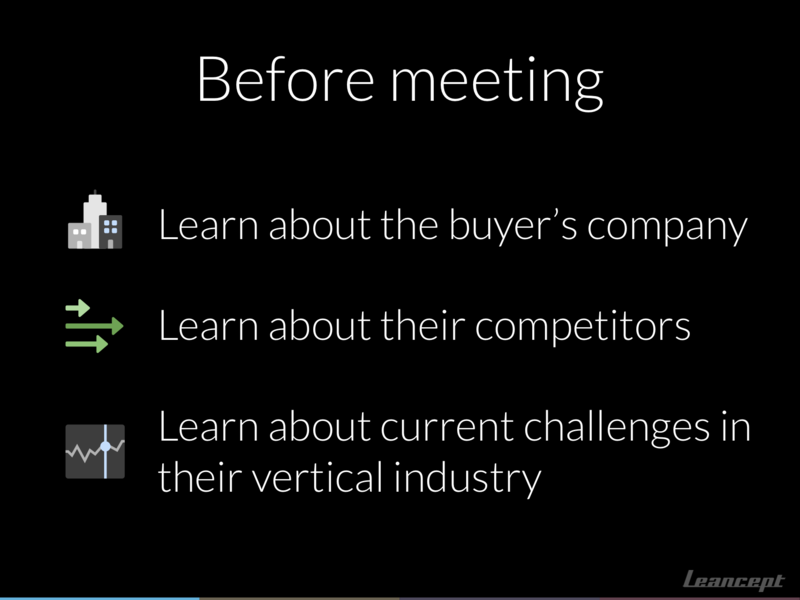 Start by analyzing the buyer’s challenges and problems using open-ended questions. Proceed to confirm what you’ve understood using confirming and closed questions. Finally, and once a shared vision has been created, prescribe your offer by discussing price, schedule, and deployment. Sales tactics wanted! How do you sell your services? What are the winning tricks that work for you? Wait, But What About Large Companies? 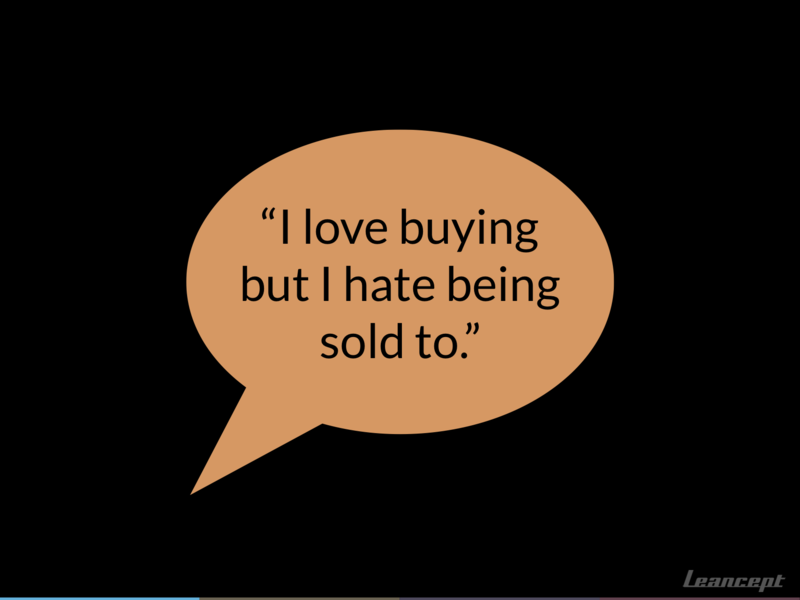 In the next and final post, we dig into the selling situations in which the buyer cannot commit on the spot. Many of the ideas that inspired this post aren’t mine. They’re borrowed from some brilliant sales leaders and their books. I cannot do these ideas true justice in this format. It’d turn into a book of its own. If this article inspired you and you want to learn more, I recommend you go to their writing to get the whole story.